Remember the days when chocolates were full of milk derivatives, all sorts of nut and gluten ingredients, and food allergens questionable to many? Well, now you can enjoy fabulous and safe milk-style chocolate filled with peanut-free sunflower butter that makes these safe for those with peanut allergies. 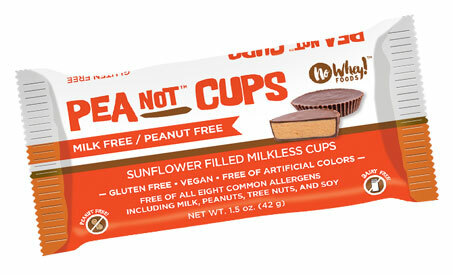 They’re also 100% dairy-free and are also free of gluten as well – you’ll have a new way to indulge in your favorite treats from the past, and you’ll never miss those old peanut butter cups again! 1.5 oz. (42g) package contains 2 large PeaNot Butter Cups. $2.39 per package. From Anonymous of Chicago, Illinois on 1/30/2016 . As close to Reeses as I have found. From Anonymous of Verdun, Quebec on 10/31/2015 . I bought these for my 3-year-old, who enjoyed them well enough, but I was surprised that I, myself, actually ended up enjoying them even more than the ones with peanut butter. Now, I didn't give them 5 stars because there is that slight aftertaste associated with soynut butter, but they've got what is, in my opinion, the perfect texture, and the salty/sweet balance is just right, so I find myself craving this particular brand over any other I've tried. From Anonymous of West Simsbury, Connecticut on 1/9/2014 . My daughter has sensitivities to many things some of which are milk & peanuts, this is a great alternative for her and she LOVES them.